Mumbai Indians have been the most successful team in IPL history having won 3 out of the 11 editions they have played thus far. Though Chennai Super Kings also won their 3rd title last year, the Mumbai Indians was the first ever IPL franchise to win the title thrice. They had made their IPL debut in 2008. But, had to wait for 5 seasons before lifting their maiden IPL trophy in 2013. Owned by Mukesh Ambani, this franchise had a disastrous start to the IPL as they could not make it to the top 4 of the first two seasons despite having the likes of Sachin Tendulkar, Harbhajan Singh, Shaun Pollock, Zaheer Khan and Robin Uthappa in the squad. However, their fortunes changed in 2010 as they made it to the final that season. From 2010-2015, Mumbai Indians always qualified for the playoffs. This streak came to an end in 2016 when they crashed out in the league stage. Mumbai Indians won the championship in 2017 just to fail to qualify for playoffs in 2018. English wicket-keeper batsman, Jos Buttler was a part of the Ambani-owned franchise in IPL 2016 and 2017. The flamboyant batsman played 14 matches for Mumbai Indians in the 2016 edition where he smashed 255 runs at an average of 23.18. His strike-rate of 138.58 helped Mumbai Indians score runs at a quick rate. Next year, Jos Buttler's performance improved a lot as he aggregated 272 runs in 10 matches, at a strike-rate of 153.67. 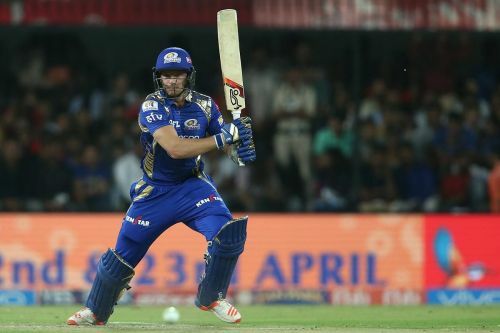 Mumbai released Buttler ahead of the 2018 season but the owners would have regretted that move very much as Buttler scored 548 runs for Rajasthan Royals in IPL 2018. IPL history: Mumbai Indians XI from their first ever match - Where are they now?